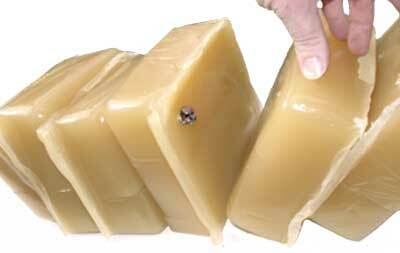 Economical, re-usable simulated tissue ballistic test media (Sim-Test) melts at 140-deg. F and can be easily cast into blocks or special shapes, such as those seen on episodes of "CSI" and "Myth Busters". Used by major cancer research centers, military test and research labs, hypodermic and implantation testing, and with embedded pressure sensors for testing helmets, protective body armor, and gloves for handling explosive materials, Sim-Test lasts anywhere from 12 months to five years when stored in a cool, dry environment and kept tightly wrapped to exclude air. A simple storage method is to use a low-cost styrofoam cooler, with plastic film tightly wrapped around the blocks. Sim-test has a density of about 1.3 gm/cc, more closely simulating muscle, brain, and adipose tissue than conventional one-use gelatins, which must be kept refrigerated and quickly spoil when brought to room temperature. Sim-Test is ready to use when received, no mixing required. It is easily cut with a thin wire stretched on a hacksaw frame (like cheese).